The Global Volcanism Program has no activity reports for Olot Volcanic Field. The Global Volcanism Program has no Weekly Reports available for Olot Volcanic Field. The Global Volcanism Program has no Bulletin Reports available for Olot Volcanic Field. The Olot volcanic field (also known as the Garrotxa volcanic field) occupies the NE corner of Spain south of the Pyrenees Mountains about 90 km NNE of Barcelona. The field consists of a large number of Strombolian pyroclastic cones and associated alkali basaltic lava flows, and is part of the NE Volcanic Province, which includes the Ampurdán and Selva areas to the SE. The pyroclastic cones are preferentially located at the intersection of E-W and NW-SE faults that cut sedimentary and metamorphic basement rocks. The latest dated eruption occurred during the early Holocene, and stratigraphic evidence suggests that more recent eruptions have occurred. Arana V, Aparicio A, Martin Escorza C, Garcia Cacho L, Ortiz R, Vaquer R, Barberi F, Ferrara G, Albert J, Gassiot X, 1983. El volcanismo Neogeno-Cuaternario de Catalunya: caracteres estructurales, petrologicos y geodinamicos. Acta Geol Hispanica, 18: 1-17. Cebria J M, Lopez-Ruiz J, Doblas M, Oyarzun R, Hertogen J, Benito R, 2000. Geochemistry of the Quaternary alkali basalts of Garrotxa (NE Volcanic Province, Spain): a case of double enrichment of the mantle lithosphere. J. Volcanol. Geotherm. Res., 102: 217-235. Mallarach J M, 1985. Geologic map of the Olot volcanic zone--lithology and geomorphology. Realitacio Cartografica, 1:250,000 geol map. Mallarach J M, 1993. (pers. comm.). Marti J, 2007. (pers. comm.). The Global Volcanism Program is not aware of any Holocene eruptions from Olot Volcanic Field. If this volcano has had large eruptions (VEI >= 4) prior to 10,000 years ago, information might be found on the Olot Volcanic Field page in the LaMEVE (Large Magnitude Explosive Volcanic Eruptions) database, a part of the Volcano Global Risk Identification and Analysis Project (VOGRIPA). There is no Deformation History data available for Olot Volcanic Field. There is no Emissions History data available for Olot Volcanic Field. 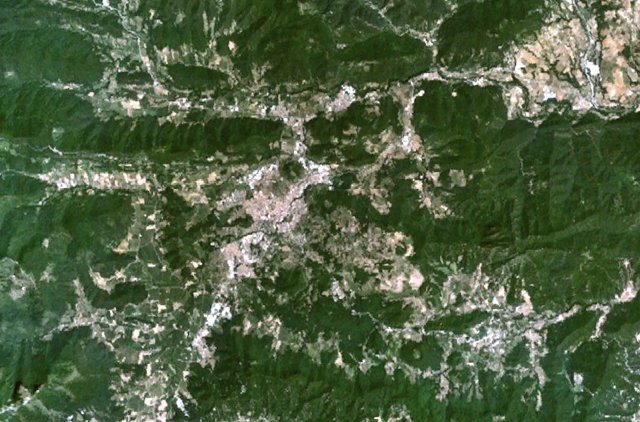 The Quaternary Olot volcanic field (also known as the Garrotxa volcanic field) lies in NE Spain around the city of Olot (the light-colored area near the center of this NASA Landsat image (with north to the top). Pyroclastic cones cover broad areas north, east, and south of the city. A voluminous alkali basaltic lava flow underlies the less forested area SE of Olot. The pyroclastic cones are preferentially located along faults cutting underlying sedimentary and metamorphic basement rocks. 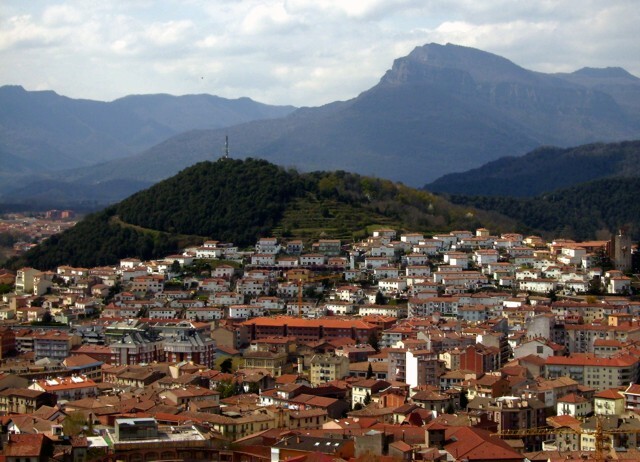 The forested Volcà Montolivet cinder cone rises above the orange-roofed buildings of the city of Olot, as seen from the Volcà Montsacopa cinder cone to the NE. The cone is part of a large volcanic field named after the city and occupies the NE corner of Spain south of the Pyrenees Mountains about 90 km NNE of Barcelona. The latest dated eruption at Olot (also known as the Garrotxa volcanic field) occurred during the early Holocene, and stratigraphic evidence suggests that more recent eruptions have occurred. Photo by Puigalder (Wikimedia Commons). There are no samples for Olot Volcanic Field in the Smithsonian's NMNH Department of Mineral Sciences Rock and Ore collection. Large Eruptions of Olot Volcanic Field Information about large Quaternary eruptions (VEI >= 4) is cataloged in the Large Magnitude Explosive Volcanic Eruptions (LaMEVE) database of the Volcano Global Risk Identification and Analysis Project (VOGRIPA).